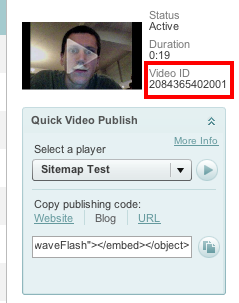 The simplest way of getting pages indexed with a video rich snippet is to "submit a video XML sitemap". Unfortunately, this advice is not much use for the majority of users, who host their content with external providers or social video platforms and are then forced to work out whether or not their hosting service does this for them, and if not, how they should create and structure a video sitemap for their specific circumstances. To help simplify the whole process, I have created this post as a reference guide for those who have video on their site and want an answer to the "how do i get video snippets?" question without having to do the additional work. Below is a glossary of the simplest and most reliable (but not the only) ways to get rich snippets for each of the major hosting platforms, which I will keep updated as a reference guide with the most up to date information I have. With Google changing the way they handle video on a regular basis and platform adjustments being frequently rolled out across the competing online video providers, I'll add in a caveat that the list below isn't 100% foolproof, but I'll do my best to keep it as fresh as possible. If you have found a simpler or better way to get video rich snippets that isn't included below, please send through the method with an example to phil.nottingham@distilled.net or respond with a comment. If it's any good, then I'll add it to the list below and give you an attribution link for your contribution. Additionally, If there is a hosting solution you'd like to see covered that's not currently included, let me know and I'll do some research before adding it to the list. A video sitemap is essentially an XML feed which details metadata that allows Search Engines to find and index your videos. Google have a created useful page with detailed information about how to structure a video sitemap, which can be found here, but unfortunately it's a fairly technical and impenetrable page. The following table details each of the required elements and what they mean, in layman's terms. <video:tag> This is essentially like a page meta tag for your video. However, unlike meta tags, there is some indication that Google will take these into account for ranking, so they're worth including. Include as many of these as feels natural, but don't overkill it. Google offer a maximum of 32, but 4-5 is almost always sufficient. <video:category> This can be included if relevant, and should reference the overarching topic or style of your video. It's worth including this, for example, if you have a lot of videos all organised in a faceted navigation. Just input a plain text term, normally one or two words, e.g. "SEO" or "online marketing"
<video:uploader> A URL (on the same subdomain as the URL referenced in the <loc> tag) for an indvidual associated with the video. Ensure the page in question has rel=author attribution and this seemingly can help to ensure your video result is additionally appended with an authorship image. Creating and maintaining video sitemaps can be a fairly dull and arduous task, so to help out, I've quickly put together a Googledocs tool which can help you scale the process for up to 5 videos. 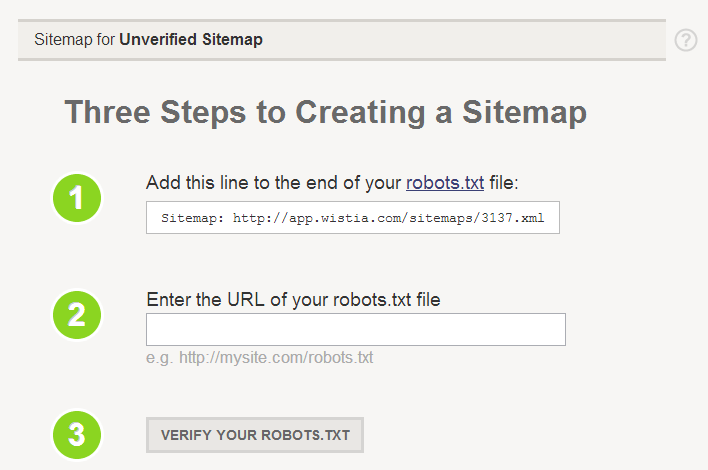 Once you've created and uploaded your video sitemap, make sure Google can crawl it by adding the URL to your robots.txt file as sitemap entry. You need to have a reasonably strong page for Google to bother crawling your video sitemap entry. As with normal indexation, a lack of PageRank and a large number of pages with videos on is going to mean that a lot of them don't get crawled frequently and your videos won't all be indexed. It can take a while for Google to recrawl a video sitemap, even for relatively strong sites, so if you're desperate for rich snippets on lots of pages, yet don't have the domain strengh to back it up - keep your video sitemap restricted to just the most important videos. Google appear to be better an indexing flash files, oEmbeds, or videos embedded with the HTML5 video tag than iframes. Unfortunately, most video platforms use iframe as the standard embed method, as it's lightweight, mobile friendly and flexible. I'm not saying that iframes can't get indexed, but it's typically slower to happen less surefire. While I'm sure they will iterate and improve in due course - if you have a weak site and are desperate to get a video result quickly, it may be worth avoiding an iframe embed. To get video rich snippets with Brightcove videos, you will currently need to create and maintain your sitemap independently of the platform. 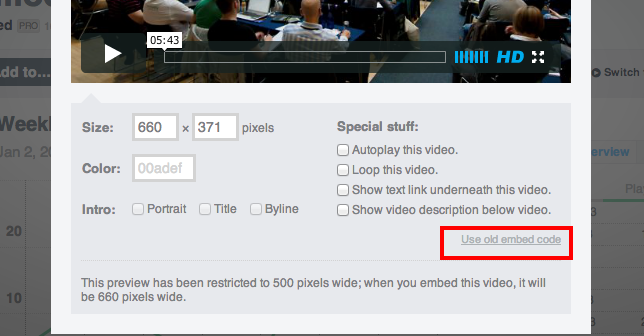 You'll need to upload your chosen thumbnail to your own site to reference in the <video:thumbnail_loc> tag. For a brightcove video sitemap, you'll need to reference a url for the <video:player_loc> tag, rather than a url for the <video:content_loc> tag. This is because Brightcove occasionally switch which URLs the encapsulated files are held at. Unfortunately (as with many things on the Brightcove platform) locating the appropriate URL for the <video:player_loc> tag is unnecessarily complicated. 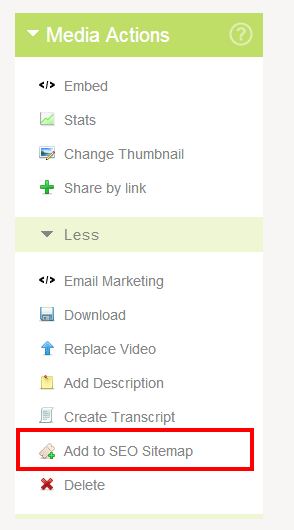 Within the "quick video publish" sidebar, select "blog". Copy and paste the HTML given into a text editor. Your task is now to fill in the blanks of the templates below with the numbers you've just pulled together. Double check that the URL you've pieced together is correct by putting it into a browser. If all is in order, it should return a full screen version of your video. To get video rich snippets with Viddler videos, you will currently need to create and maintain your sitemap independently of the platform. 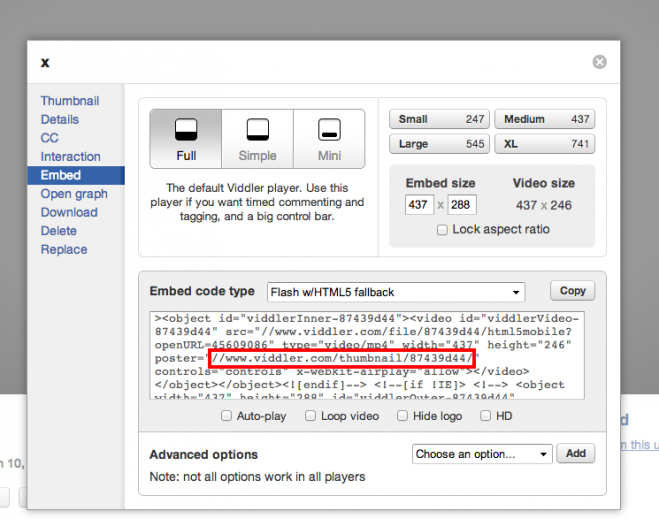 For Viddler videos, include a <video:player_loc> tag in your sitemap, rather than a <video:content_loc> tag. Locate the appropriate URL by selecting "legacy" within the embed options and copying the src element of the <embed> tag within. Put this URL into a browser (with the additional http:) and it should redirect to a file that looks like http://cdn.static.viddler.com/flash/as3/full-publisher.swf?ref=&key=UNIQUESTRING. This is the URL to include in the <video:player_loc> tag. For SEO, I generally recommend embedding your content with the "Flash w/ HTML5 Fallback" code if you're hosting with Viddler. Alternatively, if your site is on a Wordpress platform, you can use the Yoast Video Sitemap plugin for Wordpress if you host with Viddler. To get video rich snippets with Vimeo videos, you will currently need to create and maintain your sitemap independently of the platform. To locate the player URL for the <video:player_loc> tag (which, in this instance you should use rather than <video:content_loc> tag) go to the video page on vimeo.com and click "share" in the top right hand corner of the video frame. From here, click "show options", scroll to the bottom of the options then displayed and select "use old embed code"
The code in the box will then change. Pull out the src element of the <embed> tag, which should be a URL that looks like http://vimeo.com/moogaloop.swf?clip_id=12345678 followed by a load of parameters" Remove all of the parameters past and including the initial ampersand, so you're left with a plain URL, with which to populate the player location field in your video sitemap. Vzaar comes with an excellent and extremely flexible video SEO feature, which allows you to automate the creation and maintenance of your video sitemaps. However, the toolset is quite difficult to get your head around and there are lots of options for how to set-up your sitemaps within the feature. The set-up below is applicable for anyone wanting to get video snippets on their own site, rather than their video pages on vzaar.com. Ensure your account settings match the image below, with Sitemaps as "on", Include all video sitemaps as "off", Sitemap type marked as "personal sitemap" and auto sitemap generation marked as "on". NOTE: It's important to ensure you don't include all your videos within your sitemap as default, since unless you manually go through and dictate which page on your site each sitemap entry should apply to, you'll end up producing a sitemap with errors. Erroneous sitemaps can cause all sorts of indexation issues, so are best avoided at all costs. Under the heading marked "personal sitemap" there will be a box containing a sitemap line (as below). Add this line to your robots.txt file. (NB if you are unable to access your robots.txt file for whatever reason, the sitemap indicated can be submitted to Google Webmaster Tools instead. Choose "always visible" under the "Include video in sitemap?" option at the top of the page. If relevant for your specific video, you can also include information within the "additional sitemap" fields. I recommend including tags and an uploader URL if you can. The "node preview" on each video displays how you specific video sitemap entry comes together in an XML format, which can be a really useful way to double check for errors. Repeat the previous 4 steps for each video you'd like to include within your video sitemap. NOTE: Wistia has, by far, the best SEO features of any paid hosting provider If your priority is rich snippets for a large number of videos, then Wistia's probably the best platform for your needs. Go to the "Video SEO" page accessed through the "account" drop down. Select "Add video to sitemap"
Alternatively, you can use the Yoast Video Sitemap plugin for Wordpress if you host with Wistia - but given how easy it is to use Wistia's native sitemap creation tools, this isn't necessary. If you're trying to get rich snippets to your site for your own embedded YouTube videos, then you're doing it wrong. WordPress users can also use the Yoast Video SEO plugin to get pages ranking with rich snippets for embedded YouTube videos.